Stephen King decided that he didn't need to cash his check for the story rights to The Shawshank Redemption. The movie is based off of King's novella Rita Hayworth and Shawshank Redemption, which was included in 1982's Different Seasons. The story rights were purchased by director Frank Darabont in 1987, but he did not adapt it into a feature-length movie until 1994. Darabont wrote the script in an 8 week period and the movie was greenlit 2 weeks after he submitted the final script. Frank Darabont purchased the story rights to The Shawshank Redemption from Stephen King for $5,000. In a new interview discussing the success of the movie, King admits that he never cashed the check that he received from Darabont. But, he was able to repurpose it. The article goes on to say that the author actually sent the check back to Darabont. The article explains. "Mr. King never cashed the $5,000 check (director Frank Darabont) sent him for the right to turn his story into a movie. Years after Shawshank came out, the author got the check framed and mailed it back to the director with a note inscribed: In case you ever need bail money. Love, Steve." The Shawshank Redemption was nominated for seven Academy Awards (the most that any Stephen King adaptation has ever received), including Best Picture (Niki Marvin), Best Actor (Morgan Freeman), Best Adapted Screenplay (Frank Darabont), Best Cinematography (Roger Deakins), Best Editing (Richard Francis-Bruce), Best Sound Mixing (Robert J. Litt, Elliot Tyson, Michael Herbick, and Willie D. Burton), and Best Original Score (Thomas Newman). However, the movie went home empty-handed at the end of the night. 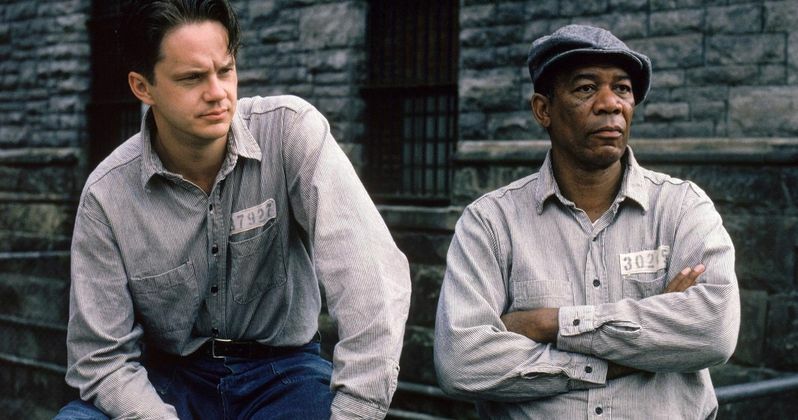 While The Shawshank Redemption did not win any Academy Awards in 1995, it is often hailed as one of the best movies of the 1990s. The movie received praise upon its release, but it was not a hit at the box office either, earning $58.6 million globally. With that being said, it was one of the top rented movies of the year when it was released on VHS and still gets played on TV all of the time. By 2013, the movie had been aired on fifteen basic cable networks, and that it took up 151 hours of runtime in that year alone. Related: The Shawshank Redemption 10th anniversary artwork and details! Stephen King has seen many of his works get turned into movies, and when asked about directors and writers taking liberty and changing things, the author admits that he likes it when they stay close to his original idea the best. King compared it to a rocket launch, noting that he purchases the launching pad and they purchase the rocket. Sometimes they're okay, but others tend to blow up, so he prefers that they stick to his story. However, he did reveal that directors and screenwriters often come up with ideas that he wished that he would have come up with. You can read the rest of the interview with Stephen King over at The Wall Street Journal.